Vintage hand painted wooden nesting eggs. 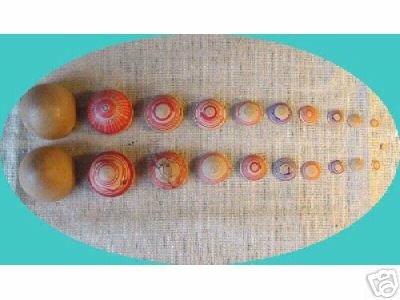 The largest in this set of 11 is 3”x1.75” and is a plain wooden egg. Inside are increasingly smaller nesting eggs, balls and disks decorated in red stripes. The smaller disks are very thin shells, almost like pistachio nuts and stack, but do not tightly nest together.